A field of proso millet in research plots at the High Plains Ag Lab near Sidney, Neb. Farmers in Colorado, western Nebraska and South Dakota grow almost all of the nation's proso millet. After harvest, most of the small grain is used for birdseed or fed to livestock. Planted acreage of proso millet is small compared to other grain crops, like corn or wheat — typically about 100,000 acres in Nebraska and 500,000 acres nationwide. But proso millet is well-suited to western Nebraska's semi-arid climate, and it fits well in the typical dryland crop rotation with winter wheat or sunflowers, according to Dipak Santra, alternative crops breeding specialist at the University of Nebraska-Lincoln Panhandle Research and Extension Center at Scottsbluff. Proso millet also has several nutritional traits that appeal to people who are health-conscious or have special dietary needs, according to Santra. So the potential exists for new markets. 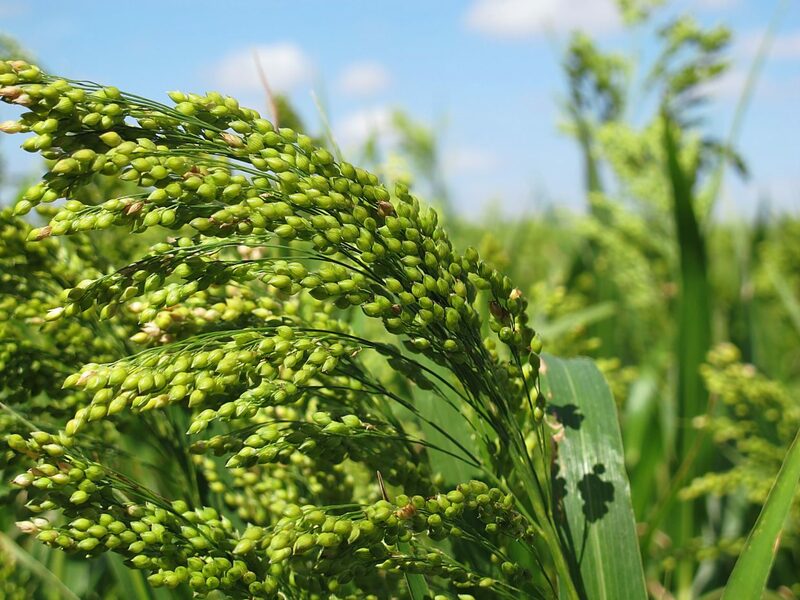 Finding new markets and uses for millet is the theme of the Third International Millet Symposium scheduled for Aug. 8-11 at Fort Collins, Colo., just a short drive from western Nebraska. The symposium is jointly organized by University of Nebraska-Lincoln and Colorado State University. Chairs of the organizing committee are Santra and Jerry Johnson of Colorado State University. The symposium will cover millet production from a worldwide perspective. It is a rendezvous for millet buyers and sellers. The agenda will include presentations by high plains producers, country representatives, millet breeders, cropping systems agronomists, millet industry partners, grain handling and processing operations. The symposium will take place at the Marriott Inn in Fort Collins. A website established for the symposium has details and links to register and book hotel rooms. Go to https://go.unl.edu/millet2018. The symposium will focus mainly on proso millet, also known as broomcorn millet, common millet, millet and hog millet. But it will also include other types of millet — pearl, foxtail, finger, little millet, barnyard millet, kodo millet and tef. These are grown commercially elsewhere in the world but in the U.S., these are grown in small scale or have potential to grow, according to Santra. Santra said proso millet is one of the ancient crops that originated in China. Much of the world's production comes from China, Russia, the U.S., Ukraine, India, Slovenia and Korea. In the U.S., three states produce 95 percent of the domestic crop: Colorado (about 50 percent), Nebraska (about 25 percent) and South Dakota (about 20 percent). "This is a perfect crop for a changing climate," he said. Proso millet is typically planted in late May or early June and harvested in late August or early September. It can extend or diversify the rotation, helping control weeds in winter wheat and reduce pressure from disease and insects, according to an Extension publication from Nebraska Extension and several other states, "Producing and Marketing Proso Millet in the Great Plains." In addition to being climate-friendly, Santra said broomcorn millet is good for human health as well. It is richer in nutrients than most other major cereal crops, according to Santra. It is a source of starchy grain and has a low glycemic index, high fiber and essential minerals. And it is gluten free. Millet is a common food ingredient in many Asian countries. In the U.S. it is mostly used as bird or livestock feed, but in recent years also is being used in human food and beverages (such as beer and whiskey). The International Association of Broomcorn Millet was established to promote development of the broomcorn millet, strengthen exchanges and cooperation in scientific research, and increase socio-economic development. The International Symposium on Broomcorn Millet is convened every two years. The first and second symposia were held in China and South Korea, respectively. The third symposium will include academic exchanges, product displays from all over the world and other activities. Representatives from broomcorn millet growing countries in Asia, North America, Europe and other countries are expected to participate. Presenters and papers will be in several categories: breeding, genetics, germplasm, genomics and biotechnology; agronomy and production; and products and markets. The symposium agenda for Aug. 8-10, will consist of oral and poster presentations, product displays, and vendor displays. A field tour is planned for Aug. 11, to the Darren Bauder farm at Fleming, Colo., and the UNL High Plains Ag Laboratory near Sidney, Neb. Invited speakers include the Colorado Ag Commissioner and several others who are involved in growing or marketing millet at the national or international level. Brainstorm sessions on efforts to improve millet marketing for new uses will be held.